In any case, South Carolina's Greenville likes to pride itself as being "yeahTHATgreenville" - I suppose signifying the unique nature of being in the Upstate. I have no real complaints about that. And ... most importantly ... there is good coffee here. Therefore, for today's coffee shop Saturday, I want to take you to an up and coming part of Greenville that a lot of folks who live here don't really know exists. This is a gentrifying, artisan community - at least in recent years. It used to be a thriving textile mill village. Until, of course, the mills shut down in the 70s. Greenville's West Village was dying a slow death. Then the artists moved in. Now, "The Village" is a growing, diverse community - and one of my favorite parts of town to hang out. And home to the Village Grind. My favorite coffee shop in Greenville, SC. It seems small and cozy when you walk in. 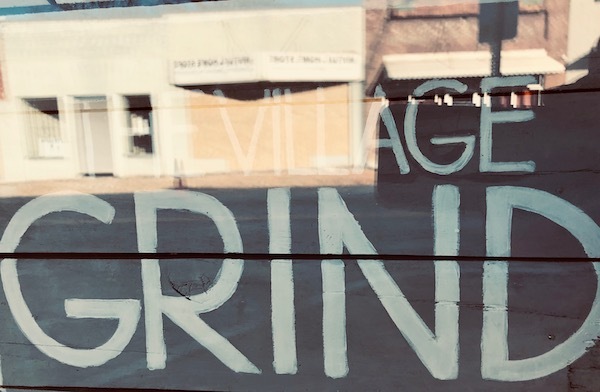 When The Village Grind first opened, it actually was small. But cozy. However, because of growth in the area, The Grind was able to share space with a neighboring restaurant and open up into what has become a grand workspace, with both private and community tables, free wifi, and (most importantly) fantastic coffee. The village grind uses a local roaster (will be writing about them in the future). I find their espresso to be rich, but without any bitterness or odd sour flavors, I occasionally find in single-origin espresso. The lavender latte is a favorite - and this is a drink of choice for members of my family. My son gets the iced mocha. He finds it to be consistent, with the perfect blend of coffee and sweetness. For me, a single-origin from Central America is always my favorite. The baristas are well-trained and create a proper pour-over. Most folks don't realize there's more to a pour-over than dumping hot water of coffee grounds (which is basically what happens when you get a pour-over from a corporate shop). Village Grind baristas barista it up well. Greenville, SC is becoming more and more of a destination city. The West Village is destination within a destination - and I can't recommend The Village Grind more strongly. Better yet - make an in-person visit! You will not be disappointed.